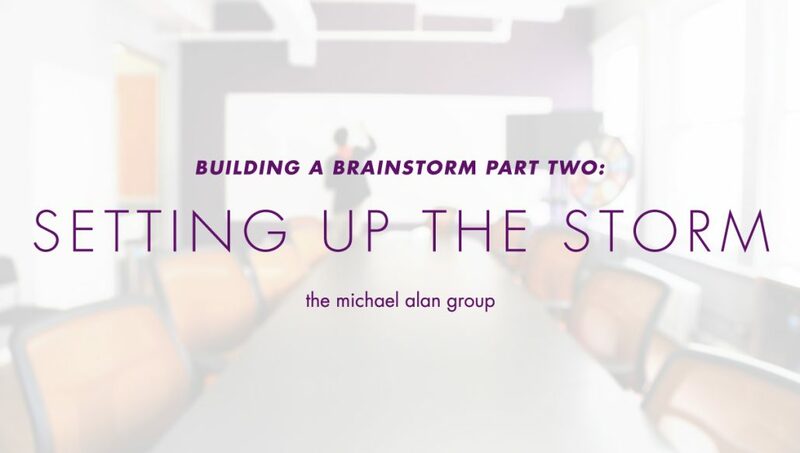 Hello, and welcome back to our three-part series on building a brainstorm. Our mission: to explore time-tested strategies for generating top-shelf experiential marketing ideas. Last time, we kicked off the trilogy with an in-depth look at how experiential agencies can elevate their RFP research process. We explored the importance of engaging with the product directly, becoming familiar with the brand, getting to know the competition, and learning to love the target. Now we’ll be turning our gaze from solo work to group work. We’ll be investigating the best ways to prepare a brainstorm, get the team warmed up, and deliver the briefing. A brainstorm is a collaborative, team-oriented exercise. There are plenty of tools to create good teamwork — tools which we’ll be exploring in this article and beyond — but none are quite as powerful as beginning with a great team. Good teams transcend departments and hierarchies: all that matters is that everybody feels comfortable speaking up and supporting each other. They should be eager to nurture each other’s fledgling brainwaves. Of course, this is easy for us to say: we’ve been blessed with a group of persistently positive, remorselessly ridiculous ideators who repel conflict and crave community. So if that describes your experiential firm too, just do what we do and invite everyone. Here are some times not to storm: Christmas. Midnight. Lunchtime. Finding the right time for a storm isn’t just about ensuring that all parties can be present physically. It’s also about ensuring that all parties will be present emotionally, spiritually, mentally, and, in short, metaphysically. If one of the team members will be on site at an experiential activation all day, don’t pressure them to free up fifteen minutes. You want to be catching people at the time of day and day of week when they’re most fired-up and storm-ready. How long should a storm be? We took a poll of three bears and they all told us the same thing: it should be just right. Time is a scarce resource. It should be spent and saved using precisely the same reasoning that we bring to the expenditure of any other scarce resource. Dedicating a serious chunk of time to your brainstorm communicates its importance. It tells your team that you’re deeply invested in the success of this project and that they should be too. Keep the storm too short and people will reason that this proposal just wasn’t worth your time. Besides, once we’ve finished covering all the factors that go into a great storm, it’ll be clear that you simply can’t rush the process. From warm-ups to briefings and beyond, there’s a lot to get done. You want to allow plenty of time to explore the material, to share bad ideas (the ones people don’t share when they’re pressed for time), and to turn those bad ideas into good ones. Still, it’s worth remembering that brainstorms are susceptible to the law of diminishing returns, just like everything else. So there is a ceiling on how long a storm ought to be. And you should probably leave some time to actually write the proposal. This is the part of the article where we pretend to understand science. This is a trick that they used in the writers’ room of The Office. Whenever they were stuck, they’d stop trying to write an episode of their own show and start brainstorming an episode of Entourage instead. The brilliance of this tactic was in the fact that it exercised the same skill set that the team actually needed to be using, but lowered the stakes down to the realm of the ridiculous. So next time, you’re trying to come up with clever experiential stunts to promote charitable foundations or foreign films, take a break to sell something awful that nobody wants. Like coffins. Or floss. A nice variation on selling coffins is to brainstorm the worst possible ways to sell the product that you’re supposed to be promoting. Preparing for a pitch to a luxury car brand? Consider parking one of their cars in Times Square and blowing it up. Or inviting consumers to power-saw their way through the car’s hood. Not only does this warm up help foster an all-ideas-welcome rapport, but it can also lead to some crazy, accidentally good ideas. You can even use warm ups to get to know your target better. Try introducing the target demographic and asking your team to do some memory-based research. Who’s a person they know in that demographic? What does that person do with their time? What sort of challenges does that person face? Do they have a pet and what’s its name? Who’s their star crush? This warm up gets people activating ideas beyond the usual scope of the brainstorm, but also gets the ball rolling toward the serious task at hand. Begin with the thing. What is this experiential marketing event selling? Go deeper than a one-sentence description. Offer an in-depth insight into what the thing does and how it does it. Share what you learned when you got hands-on with the product and what people said about why the thing matters to them. Share video of the product in action. Or, if you can bring the product in for people to handle, all the better. Get the room up to date on the competition. What other products are out there and what sets this one apart? If the field is already full, why was this product created? What problems does it solve? When you “Sized Up The Other Guys” [insert link to previous article], what did you decide to play down and what did you decide to play up? Again, try to keep things visual and tactile: don’t just tell them about the competition; show them. Who’s going to be buying this product? How do they fill their time? Where do they hang out and what do they do for fun? Why do they care about the product? Remember that when you researched the RFP, you didn’t just read about the targets, you also talked to them. Make sure to highlight the things you learned about what they love and obsess about when it comes to products like these. Finally, you want to make sure that your team understands the voice of your potential client’s brand. Getting first-rate outlandish ideas isn’t helpful if you’re pitching to a conservative company. And activations that make the product look like time-tested won’t appeal to a proudly-disruptive brand. Your team needs to know how the client thinks. In this section, it’s great to share visuals and media: show ads that the brand has used before, share some website copy, and display logo lockups. Whatever it takes to get your team thinking like the client. Brilliant ideation is fast approaching. Now that your team is convened, warmed up, and in the know, it’s time to get the winds a-blowin’ and rains a-pourin’. We’ll be back next time with ten ways to turn this storm into a hurricane.